mwe3: You always have such interesting titles for your albums. On reflection, what was it about the Hungarian town of Kismaros that inspired the Kismaros album and can you shed some light on your recent 2018 European tour and how many shows and what material was performed live on that tour? What was the reaction this time from those attending the shows? I imagine Kevin must be something of a unique attraction in Hungary, an American musician coming from the Boston area with those exotic guitars. 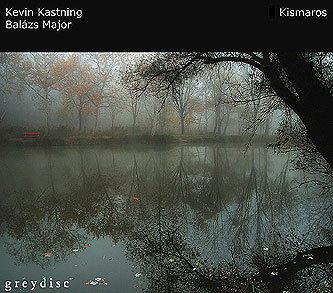 Kevin Kastning: Kismaros is a small village located on the banks of the Danube river in Hungary. It's very peaceful, and has a palpable sense of history and the presence of those who have passed on. Because the album was recorded in the Kismaros concert hall, I wanted to assign an album title that would also serve as a location on a map, to illustrate the recording location. And also to pay tribute to the town and its people. I wanted to try to allude to some sense of the overall atmosphere of mystery and time that I felt in Kismaros. The tour had a concert in Kismaros, and the mayor came to the concert and caught up to me afterwards. He is a big fan it turns out, and was very welcoming. I felt like a very welcome guest in Kismaros, and that added to using the town name as the album title. For the 2018 tour, I used the 30-string Contra-Alto guitar. It was a solo tour, but I played one duet piece each night with Sándor Szabo, which was wonderful. The concerts were sold-out, and the audiences were very receptive and appreciative. Balázs Major: We had a very successful concert in Kismaros, and then we had a two-day recording session. This small town is situated in the Danube curve and has a strong natural vibe. Driving to the recording spot the traveler can see a lot of beauty, which inspires not only a musician, but also it makes one wonder and contemplate. So, Sándor probably chose this place to record not by accident. That place made an influence also on me and on my playing. Listening back to the recording, it recalls those moods and visual wonders. mwe3: What was Kevin’s overall impression of Hungary on this tour and what other lasting memories do you have of performing and recording there and traveling in the country this time? How was the climate or weather like in Hungary in mid May? Kevin Kastning: I always love being in Hungary and touring there. Everyone is incredibly warm and welcoming. The Hungarians are a fantastic people; very sweet. The weather was like late spring; in the upper 70s/low 80s. mwe3: What were some of the challenges involved in recording with only one guitar, in this case, the 30 string Contra-Alto guitar on the Kismaros album? How did the 30-string guitar shape the final sound of the album and were there challenges in traveling on a long journey with that guitar? Kevin Kastning: This is the first time I've tracked a full album using only one instrument. It is a big challenge. Using the 30-string was the right choice; it has the Alto side, the Contraguitar side, and both sides have fretless regions. I used the 30 for the tour, and it is one of my very favorite instruments ever. As for how it shaped the final sound of the album, it was half of the instruments you hear on the record, so that is a pretty big impact. For the air travel part of the tour, I bought a seat on the plane for the guitar. So it was never checked through baggage, and it and I both had a safe trip. Balázs Major: It is always a challenge to me to play together with never-heard instruments. Kevin’s guitars are real magic instruments, though I knew their voice from his CDs, but in a live situation they effect in a different way. His 30-string guitar with his playing inspired me very strongly. mwe3: On the web, Balázs spoke about recording an album with Kevin, Roland Heidrich and Sándor Szabó. What was the chemistry like between the four of you? I ask this considering that Roland engineered Kismaros and Sándor produced the album. Was any other recording done in Hungary this time and are there any other plans to record with Sándor and Balázs as well as Roland again in the future? Kevin Kastning: We tracked new material for two albums as a trio consisting of Balázs, Sándor, and me. We tracked new material for a quartet album with Roland. Both Sándor and Roland were using electric guitars, but in very different ways. The quartet recordings were very full, like a band. The trio recordings are very different than our two previous trio records in that Sándor was using electric guitars and heavy processing and effects, along with guzheng. So these albums will be released over the coming years. The chemistry was quite good all around. I have a spiritual connection with both Sándor and Balázs. Whenever I am playing with either of them, the music takes over; it is as if we all have this almost psychic connection or system of unspoken communication. Roland is a strong and original musician whom I’ve known for several years, so it was good to work with him as well. Balázs Major: Sándor is a determinative artist in my life, we are tied-in by an almost 41-year friendship and creation in duo and different formations. We played countless concerts and made a lot of recordings, albums together. Roland is an excellent young guitar player Sándor’s ex –student, we have also a 10-year long friendship and musical collaboration in trios, and in his new quartet. Kevin also belongs to my best friends; we played and recorded a lot, so we have a strong chemistry when playing. I would say it is very easy to play with these guys. We see the world very similarly and our attitude for the music is the same. We made two Greydisc albums with Kevin and Sándor: Triptych and Becoming. Last year we started to work in a special “remote” way; I recorded drum tracks and later Kevin and Sándor played overdubs on them, and this recording will be Ethereal II, which will be released in the early autumn of 2018. This album is special to me because I play not only hand percussion, but also a full drum set. Though my name mostly appears in formations where I play hand percussion, I am a jazz drummer. mwe3: Balázs describes Kismaros as being enigmatic and nature-related. In what ways would you say the Kismaros album has a nature-related sensibilities and would you say the CD cover art backs up those themes? What can you tell us about the CD cover art by László Hutton and also the interesting looking photo on the inside of the album? Kevin Kastning: Speaking for myself, I’d say all of my records are nature-related, as I find nature to be a strong source of renewal and of art. Kismaros is no exception. The cover art is by László Hutton, a Hungarian photographic artist. László has done a few of my previous album covers; I admire his work. For Kismaros, I wanted something for the cover that had an essence of Hungary. I had recorded this album with Balázs, a Hungarian artist, and the album was recorded in Hungary. I wanted Hungarian art on the cover to show proper tribute and how indebted I felt to the Hungarian people, as well as to illustrate the connection of the music to Hungary itself. The photo is of a nature preserve in Hungary that I visited on my first tour there several years ago. The atmosphere of the photo fits with the mysterious nature of the pieces on the record. I did the photo in the gatefold. Those are totems in Kismaros, right on the banks of the Danube river. I’d pass them every day on the way to the concert hall, and they seemed to have a palpable presence to them. Very historic, and they had the sense of being sentries, sentinels, and keepers of the past. They exuded such a strong presence that I wanted them to be a part of the Kismaros album, as they were and are a part of the village of Kismaros. Balázs Major: About the pictures taken by László Hutton it is not much to say just enough to look at it and my imagination starts, it is like as if I would live in them, the misty spots are the mystery themselves, there are a lot of secrets behind them, just like in the music. mwe3: The sheer amount of percussion instruments Balázs plays on Kismaros is quite impressive. What were some of percussion instruments that were played on Kismaros especially as they look rather intriguing including the bowl shaped instruments. Did Balázs use the full range of his instruments on the new album? Did some tracks require different percussion instrumentation? 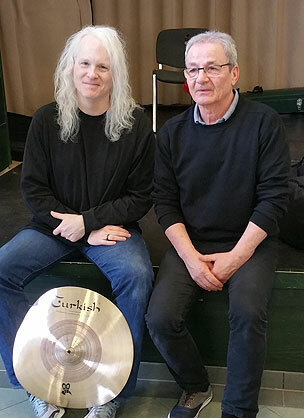 Kevin Kastning: I think Balázs was changing cymbals for each piece, which is great. I love cymbals, and he has some beautiful ones, as you can hear on the record. 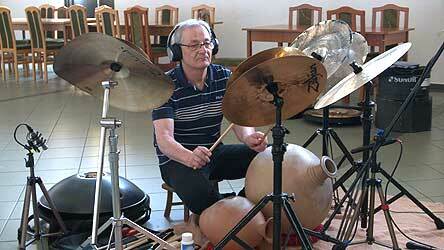 Balázs Major: The special hand-percussion I use are a sort of clay drums. They have a few thousand of years of history. They originate from Nigeria and their actual name is UDU. 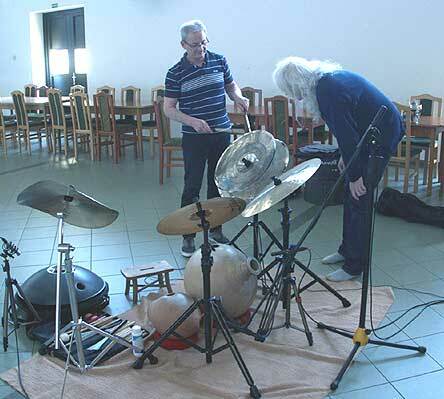 In my percussion set they become even more special because they are combined with several different sounding cymbals, and they together create a very special set which is not typical in the modern music. They provide a completely different approach and sound in rhythm. I use a lot of cymbals, but somehow I use those types of cymbals, which are not preferred by other players, so my whole set is like something from another planet. They fit perfectly to Kevin’s music and sound. I like experimenting with them and I often make my own drum sticks. I like to use unusual combinations. I use maybe 50-60 different sticks which I change during playing and this is why the sound is very rich and changing all the time. I did not use all my percussion on the recording only the most special and extreme sounding ones. mwe3: What was involved in mic-ing the instruments during the Kismaros recording session? Did microphone placement affect the sound of the album sound and how did you balance the low frequencies of the percussion with the guitar sounds? I noticed some unusually low or sub frequencies on this album... Was a special balance of sound created to capture everything with the microphones, so not to get too high or too low a frequency in the recorded sound? 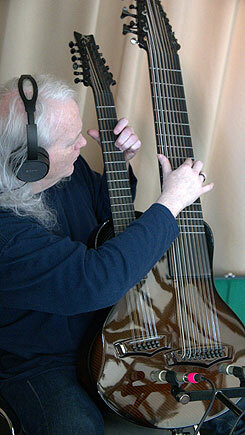 Kevin Kastning: The 30-string has some very low sub-bass frequencies; its range goes lower than a bass, so it can create some recording challenges. My recording setup for Kismaros was different than my usual studio setup. For the Kismaros recordings, I used my K&K stereo pickup system, along with a matched stereo pair of Shure KSM-141 microphones. Sándor did all the mixing and mastering, so the balance to which you refer was accomplished by Sándor in the mixing phase. 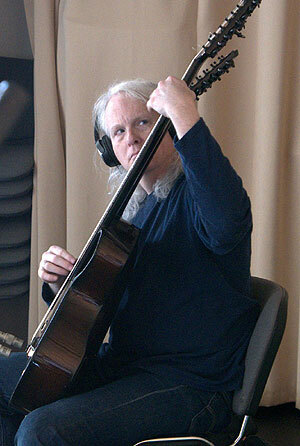 Roland Heidrich was the recording engineer for the sessions, and he did a truly remarkable job on everything. Balázs Major: When I record drums or percussion, Roland or Sándor is my sound engineer. They both have a great assortment of microphones. This time we used Sándor’s DPA 4011 matched pair for percussion. Sándor has a simple but very effective concept for recording which can be described in one sentence: “The less microphones, the less problems and the cleanest sound.” I trust them because I never heard myself in such a high quality as how Roland and Sándor can capture the sound of my instruments. My udus have real sub-harmonic range. When I got my larger udu, it was very unusual to hear that extra deep range but after a while it became an indispensable element of my sound. A regular sound engineer would cut this range, but we keep it. Our music is sparse and has space for everything. Our recordings have been utilized for testing the frequency range of HIFI systems. I used extra high range cymbals, but Sándor found a way how to capture all my set with only a stereo pair of microphone without EQ or cutting any ranges. We do not use EQ for the percussion. The EQ is actually done by the microphone itself, and by the proper position, this is why in the mixing process there is no extra EQ. mwe3: Being that the album features tracks called “Kismaros I” through “Kismaros VII”, how do the album pieces vary and compare with each other. Were the tracks edited in some way during the sessions or was the session recorded in one continuous recording with editing and track selection done afterwards? Did the producer give any instructions or feedback during the recording and how much editing or sonic manipulation was done post-recording? Kevin Kastning: The album was recorded in a single session one morning. The pieces on the album are in the same order as they were recorded. I asked Balázs early that morning if he’d mind tracking a duo piece with me; he said sure, so we did. At the conclusion of that piece, which is “Kismaros I” on the album, Sándor insisted that we record an entire album right there, right then. Which we did; the directions were determined by Balázs and I.
Balázs Major: As much as I know Sándor, as a producer and mixing engineer told me that he left everything in its original state. Hi did not cut out parts, and also the sequence of the songs were the same as how we played them. I could say it is an almost untouched recording in this aspect. Sándor helped us during the session and actually he encouraged us to record this duo album. 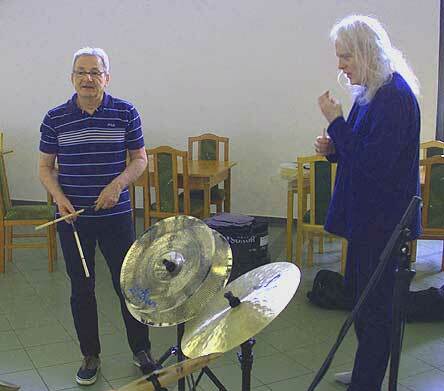 He was listening to the recording on his headphone during the entire session and he had some ideas to me to change the combination of cymbals, because I used some new ones which he did not hear before and we experimented with them. Knowing Sándor’s acoustic recording concept, he is very demanding in microphones and he always spends enough time to choose the right acoustic place to record. He uses sound manipulating devices, only if there is no other way to make the proper sound. On the Kismaros album he used only a high-end reverb for the entire mix. mwe3: How do you compare Kismaros with the other albums on Greydisc that also feature Kevin with both Sándor and Balázs? What other Greydisc albums is Balázs playing on and was the last time you all recorded together on the 2013 Becoming album? Can you compare, perhaps offer a sonic reflection, of Kismaros with Becoming? What other albums has Balázs recorded on or released over the past few years? Kevin Kastning: Kismaros is quite different to the extent that it doesn’t compare to our previous trio records. We do have a new trio record being released later this year entitled Ethereal II. This is the second entry in the new Ethereal series. While it is still a trio record, it too is so different from the previous trio records that a comparison is not possible. Balázs Major: Each album is different, it is not worth to compare them because they were made in different periods of our artist life in different circumstances and instruments. As for myself in the last few years I recorded with Michael Manring, Ralf Gauck, Claus Boesser Ferrari, Alf Wilhelm Lundberg with Sándor as a constant partner. Some recordings were live concerts and some overdubs in studio. The Asymmetry album is an overdub creation. 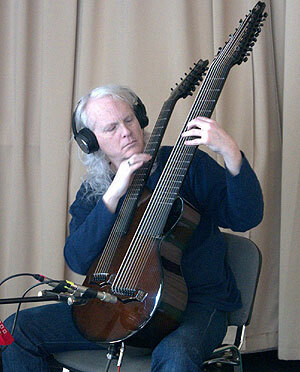 Sándor experimented with Michael Manring’s prerecorded tracks. He overdubbed on them. Later he showed me the result and asked me to play some overdubbed percussion. That is a very special album, but it was not economical to print real CDs, so Asymmetry is only a digital download album released by Greydisc. That is a pity that online magazines do not review digital albums. We started to work on the Ethereal series which is a long-term project and as such it is challenging to me as a percussion player because this series has a special concept to show that “there is life behind the grooves”. You can imagine as a percussion player I am not against the grooves, but it is really very obvious that the music world is going to a uniformed “groovy” direction. The Ethereal series is a kind of fresh oasis with its sparseness and soulfulness to show beauty in the music which in other situations could have been obscured by the dense and loud grooves. mwe3: What other plans do you have for 2018 as far as new Greydisc releases, upcoming recording and live performing in the near future? Kevin Kastning: Upcoming Greydisc releases are Ethereal II, the new trio recording with Sándor and Balázs. My next solo record is in the can, and will be released in late 2018. In 2019, there are about a half-dozen albums slated for release; most of those are already in the can. I am in the studio with Mark Wingfield in August this year for our next one, and then in September I am in the studio with Carl Clements for our new one. I have a concert or two with Carl later in 2018, and Wingfield and I are doing a live radio performance for WNYC in New York City on August 13th, 2018. I also have an upcoming recording project with Estonian composer/guitarist Robert Jurjendal, and I’m looking forward to that. Balázs Major: In 2018 I will have quite a lot concerts with a band called BOGA and we planned some overdub recordings with Sándor for further Echolocation and Ethereal projects.